Rental car companies like Avis and Hertz are giving personal customer data to a company called American Traffic Solutions, which uses this information to charge your credit card if your rental is busted by one of their traffic cameras. 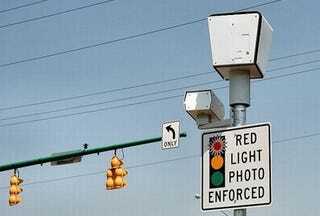 It works like this: A driver rents a car from Avis, Budget, Hertz, or Advantage, and during some point in the car's life, it's seen speeding by a traffic camera. Since the car passes through so many hands, exactly who's behind the wheel at the time of the ticket is tricky. That's where American Traffic Solutions steps in. ATS uses information provided by the rental agencies to match drivers with cars and times of day, and link the ticket to a person. Nothing egregious about that. You do the crime, you do the time. The process grows sordid when ATS automatically bills the accused driver's on-file credit card for the ticket — and a $30 processing fee, without ever giving the driver the right of due process.